Jeff May, master carver and sculptor, began his full-time career as an artist back in 2000, a journey that he admits has been both challenging yet very rewarding. His initial interest in wildlife and nature- themed art comes from time spent earlier in his life, growing up the on the beaches of Ventura, California. With the Channel Islands National Park lying just off shore, Jeff was constantly exposed to a vast array of marine life. One of the many highlights was the opportunity to release a juvenile grey whale from a drifting gill net over open water. He wouldn’t realize until much later, but the experiences he had there on the ocean are what set the stage for a life-long connection with created things. 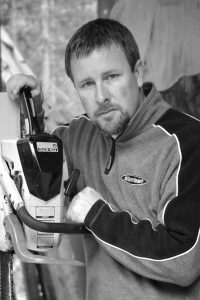 Receiving his 100-ton masters boat captain license at the age of 19 enabled Jeff to work in industries of sport diving, tourism, and research. Some of these experiences have led to incredible opportunities to interact with wildlife and wild places from Southern California to Alaska. However, with a strong desire to raise a family, Jeff felt God leading him in a new direction… Over a period of time he was able to leave the demands of working offshore and begin a new chapter as a sculptor. Jeff says, “Creating art can be both a fluid, and an extremely convoluted process. An artist’s willingness to explore, and if necessary… fail, is a crucial part of making art. I think that being self-taught gives me the freedom to expand my creativity outside the lines, so to speak. My experience allows me to work in a variety of mediums, exploring the strengths each one has in its ability to add interesting characteristics to my sculptures. Jeff now lives on ten wooded acres in Northern Idaho with his family of five, where he works from his home based studio. Surrounded by numerous mountains, lakes and streams, Jeff draws great inspiration from the wildlife and landscapes of this beautiful place he calls home. You can read more about Jeff’s journey as an artist by following his monthly newsletter, where he shares inside peeks of his life and the pursuit of art.